This entry was posted in Training Tools and tagged engaging, first hand experience, learning from mistakes, lessons, lessons learned, listening, mistakes, reflection, stories, storytelling by Ashraf Al Shafaki. Bookmark the permalink. Nice idea! I impressed thorough this idea..because it is very easy way to lean any thing. And vary important to gain good points during a short session of any training. Yes I agree with you Sanya. After all, children learn a lot and very rapidly through storytelling so why not use it for adults too? 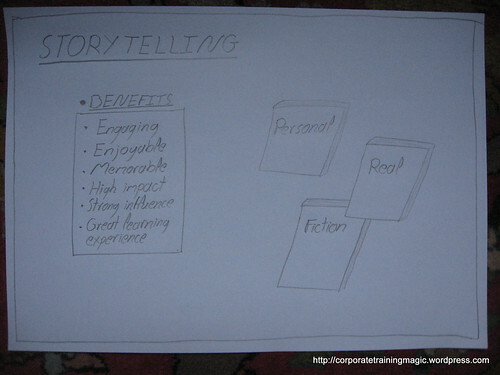 Storytelling is also a powerful method for changing the beliefs of people and thus influence their behavior.